Manatees range in color from gray to brown. They use their two small front flippers to crawl along ocean or river bottoms. Their flat, horizontal tails are pumped up and down to move them along. Despite their small eyes and lack of outer ears, manatees are thought to see and hear quite well. One of the closest surviving relatives of the manatee is the elephant. Manatees have many anatomical parallels with elephants, including a long, flexible nose or trunk, whiskers, and toenails. 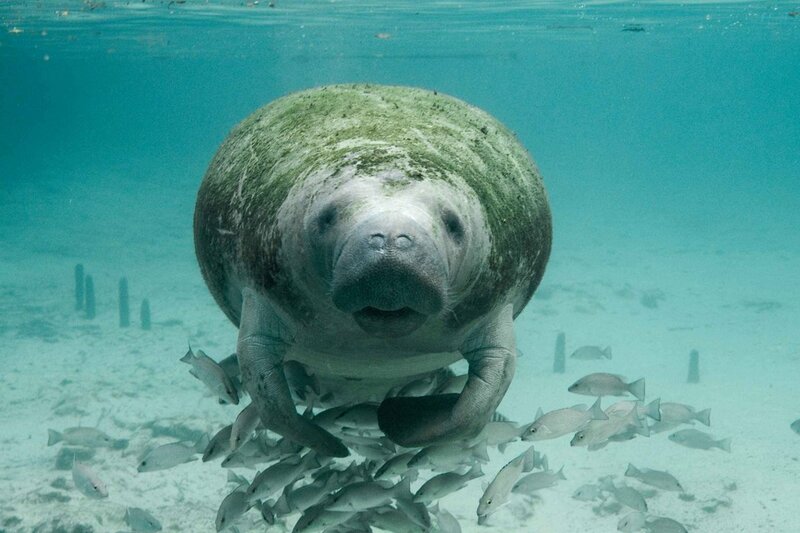 The average adult manatee weighs 1,500 to 1,800 pounds and measures ten to 12 feet in length. The largest population of manatees is found in Florida, where over 5,000 individuals now live. Manatees are thought to live 50 to 60 years in the wild. Manatees take up residence primarily in Florida’s coastal waters during winter and migrate either as far north as the Carolinas or as far west as Louisiana during the summer months. Manatees inhabit the shallow, marshy coastal areas and rivers of the Caribbean Sea and the Gulf of Mexico (T. manatus, West Indian Manatee), the Amazon Basin (T. inunguis, Amazonian Manatee), and West Africa (T. senegalensis, West African Manatee). West Indian Manatees enjoy warmer waters and are known to congregate in shallow waters, and frequently migrate through brackish water estuaries to freshwater springs. Their natural source for warmth during winter is warm, spring fed rivers. Manatees can be found in the warm waters of shallow rivers, bays, estuaries and coastal waters. Rarely do individuals venture into waters that are below 68 degrees Fahrenheit. Manatees often congregate near power plants, which warm the waters. Some have become reliant on this source of unnatural heat and have ceased migrating to warmer waters. Manatees are herbivores and eat marine and freshwater plants. Well known for their gentle, slow-moving nature, manatees have also been known to body surf or barrel roll when playing. Normally they rest and feed often. Manatees communicate by squealing under water to demonstrate fear, stress or excitement. They emit a wide range of sounds used in communication, especially between cows and their calves. Adults communicate to maintain contact and during sexual and play behaviors. Taste and smell, in addition to sight, sound, and touch, may also be forms of communication. Manatees are capable of understanding discrimination tasks, and show signs of complex associated learning and advanced long term memory. They demonstrate complex discrimination and task-learning similar to dolphins and pinnipeds in acoustic and visual studies. After a one-year gestation period, calves are born weighing between 60 and 70 pounds and measuring about three to four feet. Most manatees have a pattern of scars on their backs or tails from collisions with boats. Scientists use these patterns to identify individuals. But these collisions can be fatal for the manatee. Besides boating accidents, manatees have been found crushed or drowned in flood control gates and also suffer from pollution and habitat loss. All three species of manatee are listed by the IUCN as Vulnerable to extinction. Although it does not have any natural predators, human expansion has reduced its natural habitat in the coastal marsh areas and many manatees are injured or killed by collisions with powerboats. Manatees occasionally ingest fishing gear (hooks, metal weights, etc.) during feeding. These foreign materials do not seem to harm manatees, except for monofilament line or string. This can get clogged in the animal's digestive system and slowly kill the animal. They can also be crushed in water control structures (navigation locks, flood gates, etc. ), drown in pipes and culverts, and are occasionally killed from entanglement in fishing gear, primarily crab pot float lines. Manatees are also victims of the animal entertainment industry. They are found on display at aquariums, denied their wild nature, strong family bonds and natural social interactions. Like all captive wildlife, they face constant stress and are denied their wild nature and social structures. The needs and desires of humans comes before the needs of the animals in the animal entertainment industry.